Boston Celtics forward Jayson Tatum drives between Philadelphia 76ers guard Ben Simmons and guard JJ Redick during the second half of Boston 117-101 win in game one of the second round of the 2018 NBA Playoffs at TD Garden. There is a sizable portion of the Philadelphia fanbase growing impatient with the lack of production from No. 1 overall pick Markelle Fultz, and the noise has only grown louder with the Sixers kicking off their series against Boston. The Celtics who traded the pick Philadelphia used to select him ended up with former Duke star Jayson Tatum at No. 3, and he has looked every bit like a future star during his rookie campaign. 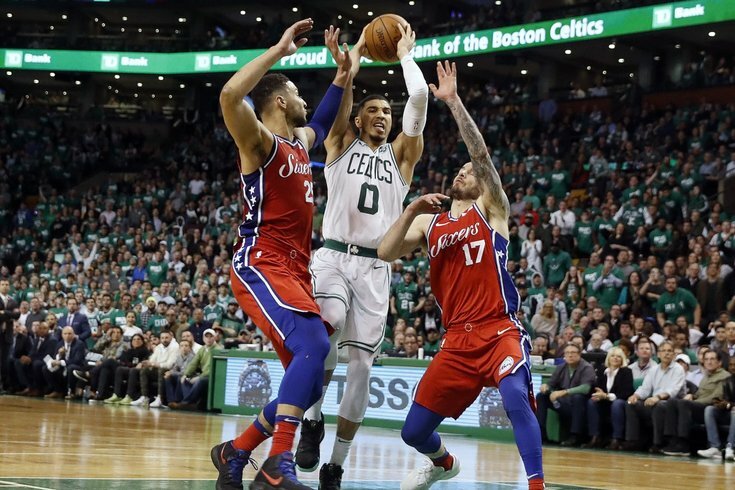 His 28-point outburst in Game 1 on Monday — a career-high for Tatum in his young career — has sparked further discussion about his future and what could have been in Philadelphia in the days since. And Julius "Dr. J" Erving, who was listed as a special advisor to ownership in previous years, went so far as to say that the guy who carved up the Sixers on Monday should have been the pick last June. During an appearance on ESPN's Get Up on Thursday morning, Erving was asked by the panel about his thoughts on Tatum vs. Ben Simmons as both cities prepare for Game 2. After showering Simmons with some praise, Erving set his sights on the rookie scorer. "Tatum probably should have been the first pick in the draft. He was there, I guess there was just, it was all about the fit. And we took Fultz, Philly took Fultz, and obviously Fultz's whole rookie year — I think he'll be a rookie again next year sorta like Simmons because of the injuries," said Erving. "But Tatum has been awesome, it just seems as though when you get a player who can raise the level of their game at playoff time, you've got somebody special. "Usually after college, it's a struggle to make it to the next level, and that's why there's only a handful of players who really make it to the next level, and now when you make it to the next level and you're able to elevate your game — aka [Donovan Mitchell], Tatum, and a few of the rookies." It's impossible to argue against Tatum being the better and more valuable player right now. What's worse, Ben Simmons' emergence as a true point guard this season and Tatum's excellent shooting from deep have made the fit questions Erving mentions look really silly in retrospect. If the Sixers had plugged in a guy who could score in isolation, shoot better than 40 percent from deep, and carry the offense for stretches this season, they likely win a few more games and have an even higher ceiling to hit in these playoffs. They're also a scarier defensive team with Tatum. Another athletic wing playing alongside Simmons and Robert Covington would make scoring on Philadelphia even tougher, and Tatum has been one of the more consistent defensive players in the class in his rookie year. What really adds insult to injury for Philadelphia is the lack of production they've gotten out of Fultz and the cost of acquiring him in the first place. Their rival franchise to the north not only has the more impactful player for this playoff run — and until/unless results change, the better player moving forward — they acquired a valuable draft asset in the meantime. Erving is not exactly treading on new ground here, but it's a pretty remarkable development for a franchise icon to opine in the middle of a playoff matchup that his team should have taken the guy the rival acquired. This is, after all, the same Dr. J who once got into an in-game brawl with Celtics legend Larry Bird, and is as invested in the franchise rivalry as any Sixers great. This debate is not going away anytime soon, at least until Fultz proves he can reclaim the jumper that made him the No. 1 overall pick in the first place. You can watch the full clip of Erving from Get Up below, where he talks about the rivalry, his best moves, and closes on the Tatum note around the 5:00 mark.